Seen on a summer day in 1957, as noted by its 'Jones Beach' destination, and standing at an unfamiliar railroad station presumably in Nassau County, Long Island is fleet # 206 - a 1953 Checker Transit Model 01 and operating for the Checker Bus Corporation of parts unknown (perhaps someone in the audience can better pinpoint the location of both the station and the company). Standing behind the Checker also destined for the beach is a GM of the 3612/3714 class carrying a similar livery but I find no new purchase for Checker Bus in GM production records and, at first, thought it might be ex Schenck but it does not carry the custom directional signals found on all of Schenck's new Old Looks. Of note on the Checker is the unique standee glass over the destination sign providing passengers with a less back bending view of the stops ahead. A brief history of Checker Transit Manufacturing Co. In 1950, the Checker Motors Corp. of Kalamazoo, MI bought out its partner Transit Buses, Inc. which then became a subsidiary of the Checker Cab Manufacturing Corp., with the buses now built and sold by Checker. manufactured with the majority purchased by Detroit's Department of Street Railways (DSR). Very interesting, Mr. 'L'. Could that upper 'window' on the Checker also be used for an additional destination sign? And perhaps it's an optical illusion, but the top part of the side windows on that GM seem to be 'jutting' out a bit in the photo. I am not familiar with the station in the photo, but isn't Freeport where buses now run to Jones Beach? I could be either Freeport or Wantagh. Freeport grade elimination was finished in October, 1960, and Wantagh in 1968. In June, 1945, I rode a bus from the south side of Wantagh station to Jones Beach. Over the years, the connecting bus service became better from Freeport. In summer, 2011, there are no buses from Wantagh to Jones Beach. I will have to look at the structures of old eastbound stations to see which one this is. From the angle of the sun, the bus is faced west on the south side of the tracks. 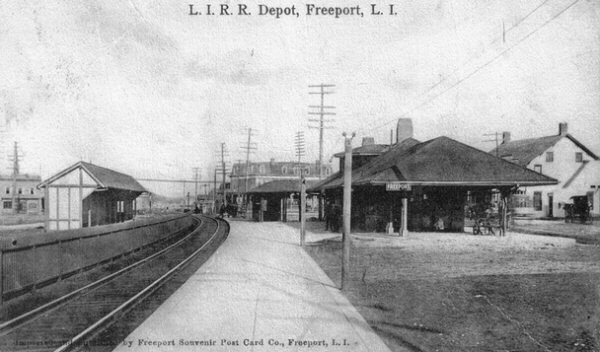 A 1907 view of the LIRR Freeport station shows two buildings on the eastbound side, but only a shelter on the westbound. I suspect (but cannot prove) that the Checker has stopped next to the more distant structure on the eastbound side, which may have been a baggage or freight station. Unfortunately, the other photos I have located date from the work of grade elimination in 1958-1960, when temporary tracks were placed where the bus photo is. As an aside, on the LIRR there are several instances of the stations located adjacent to the outbound track, to give shelter to those who have gotten off the train. Nowadays, its a bit odd, as in Sayville and Oakdale, the larger, older waiting room (and place where tickets were once sold) is on the Montauk-bound side, while the westbound side has only ticket vending machines and glass shelters. In some places, the only TVM's are on the outbound side! Most likely Freeport, because it was much more of transit hub than Wantagh, especially in the 1950s when this photo was not doubt taken. Checker Bus Corp. was based in Hempstead, as far as I can remember. It operated today's N72 service along Hempstead Turnpike, connecting Hempstead to Farmingdale. The Checker/Transit bus is similar to a small fleet (3) that ran for Universal Bus in Great Neck in the 1950s and 1960s. They were distinctive-looking buses, not terribly attractive in my opinion, but did serve a purpose for light and medium duty routes. I also remember Checker Bus because for about a year (1959) it was awarded the school bus contract for the district where I lived, and did not perform well. After much public outcry the contract went back to the previous provider, Schenck Transportation, which then continued to provide the school bus service satisfactorily for many years afterward. I did not ride the school buses, as I lived close to the schools, but was an "observer" even in those days. For what it's worth, Suburban Transit, which operated in Montgomery County, Maryland (suburban Washington, D.C.) had four of them that they bought new. They didn't have the sun visor or the standee window in front. Three were in their red and gray colors and one was yellow and used in school bus service. It had red flashing light mounted on the top. 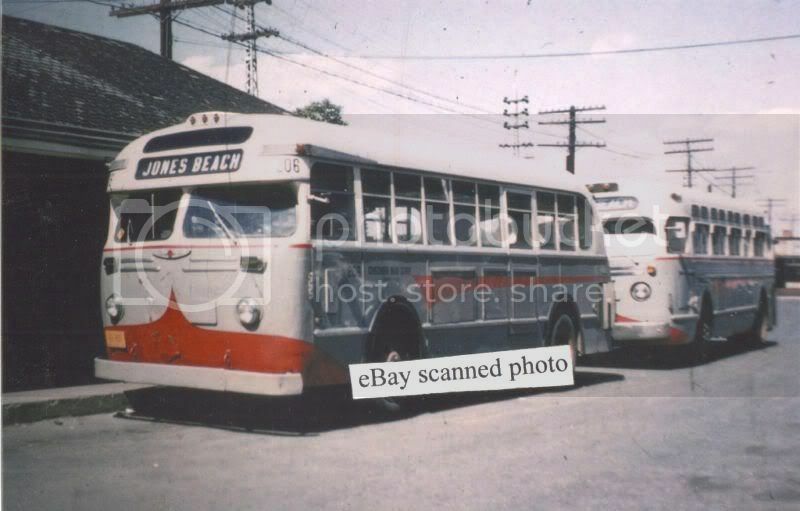 I remember both Transit & Checker buses very well as I rode them regularly in Newport, R.I. where I spend my summers with my grandmother back in the '50's and early '60's in Middletown. Newport operated both Transit Lines that used Transits and Checkers exclusively and Newport Bus Company that ran small old look gas GM's exclusively. The Transit/Checkers were workhorses and were able to climb the steep hills with their Continental gas engines - as long as the driver downshifted into 2nd gear! They had hard suspension and the windows rattled loudly! I used to go bus watching at the old Hempstead terminal in the early '60's and remember seeing a Checker now and then.